Parade of Gingerbread Houses – enter for a chance to win an Amazon gift card! The holiday season is upon us, and that brings many traditions that we enjoy with our families. Many of us take the time to decorate gingerbread houses, which are then proudly displayed as the holidays come and go. It doesn’t matter if they are artfully created, or lovingly thrown together by little hands, each of these houses (and the memories that are attached to them) are cherished long after the season is over. 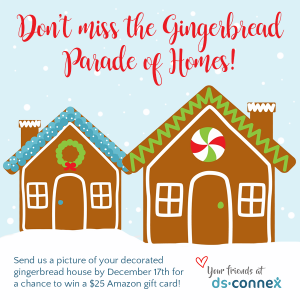 Wednesday, December 12th is National Gingerbread Day, and ds-connex wants to see your sweet creations! Send us a photo of your decorated gingerbread house by December 17th for a chance to win a $25 Amazon e-gift card. We can’t wait to see your entries! 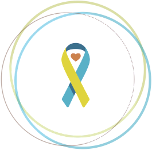 Entries must include a photo and brief description (including your name and the Down syndrome association with which your family is affiliated), and should be emailed to contests@ds-connex.org by 11:59pm EST on 12/17 to be considered for the prize drawing. When submitting entries using a mobile device, please ensure that “ds-connex” is not autocorrected (we’d hate to miss out on receiving your entry!). One winner will be randomly selected on Tuesday, December 18th and announced on the ds-connex Facebook page; the winner will also be contacted via email. We will share random entries across our social media platforms, and all entries will be shared in an album on Facebook after December 17th. This promotion is sponsored by ds-connex.